Tablets are taking over the enterprise. According to a recent IDC report, PC sales will drop by an all-time year-over-year record of 10.1 percent. That's a nose dive by any standard. Why the quick decline? Over the past year, Apple, Amazon and even Microsoft have pushed mobile computing on a tablet as a way to stay connected in business. A tablet gives you fingertip access to email, a speedy browser, enterprise-scale apps that can tap into corporate servers and a low price (something that's quite attractive to upper management). The latest models push the processing envelope even further -- in some cases, providing full multitasking between apps, fast 4G cellular access and accessories such as the Logitech FabricSkin Keyboard Folio to essentially turn a tablet into a laptop. Choosing the right model can be difficult. The three tablets reviewed here all use a 10-inch screen, run business apps, connect over Wi-Fi and work fine for reading books on the plane or playing games before a meeting starts. They each have distinct advantages. We explain some of the benefits of each tablet (and mobile operating system) for business users without diving into the boring technical specs too much. 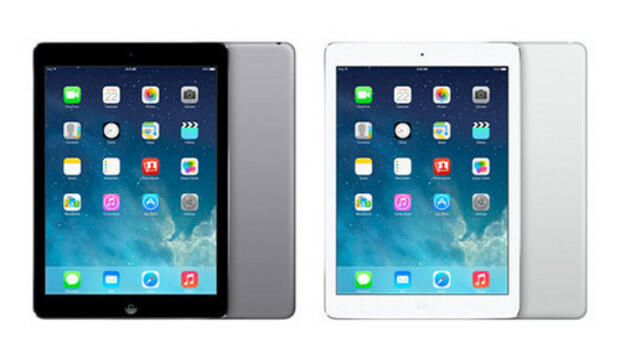 The clear leader in tablets, the Apple iPad Air is fifth-generation model. It's easily the lightest, at just 1 pound (for the Wi-Fi only model), and surprisingly thin, at 0.29 inches. Once you realize how portable it is, the new iPad Air becomes much more attractive -- but for business users, the real advantage is that there are so many accessories. For example, there are at least eight cover keyboards, or covers that also include a Bluetooth keyboard, and at home you can stream music to wireless speakers such as the B&W Zeppelin Air designed specifically for iOS devices. App selection is similar to Android tablets, such as the Kindle Fire HDX (discussed below). However, apps for iOS often include extra features: Evernote for iPad, for example, includes a way to scan 3M Post-it notes and an easier AirDrop system for sharing your notes with other employees. Another bonus is that productivity apps such as Keynote (for presentations) and Pages (for documents) are now free. The 16GB iPad Air costs $499; this is significantly more than most tablets, but it's worth the extra expense. If you add 4G LTE service, the price jumps up to $629. The Air lasts about 10 hours, snaps 5 megapixel photos and runs on a fast 64-bit processor -- a first for tablets. This is the tablet you want for employees who need the widest app selection. The Amazon Kindle Fire HDX 8.9 is the tablet with the tech support feature you've likely seen on TV. CIO.com tested this feature and found it worked amazingly well -- even if the technician who helped us was actually a burly guy in his 30s, not the spokesmodel you see on TV. Select the Mayday option and video chat with tech support (who can't see you) to troubleshoot issues such as getting Wi-Fi to connect in real-time. For a business, it's a brilliant way to solve problems. At 0.35 inches thick and 0.82 pounds, the HDX is a thicker but lighter than the iPad Air. The 2.2 GHz quad-core processor is fast, but it doesn't run in 64 bit like the iPad Air. One major bonus: The HDX lasts 12 hours, about two hours longer than the iPad Air. Android tablets such as the HDX generally have many of the same apps you will find on an iPad, including Skype, Evernote, Freshbooks, travel apps such as TripIt and Logmein Ignition for remote access. It's actually rare to find a mainstream iOS app that's not on Android. In the past, Android tablets (and phones) were the only place to find Google apps, but that's no longer true, as apps such as Google Maps, Voice, and Gmail are all available on the iPad now. Still, there's a more limited selection of productivity apps for Android. Even though there is a mobile version of Word for Android phones, you won't find anything like Microsoft Word or Apple Pages. In most cases, you'll likely end up using Google Docs in the Web browser. One key Kindle Fire difference, though, is the Silk browser. On the HDX, some of the Web processing occurs on Amazon servers. In tests, sites such as CIO.com and ESPN.com tend to pop up faster over the same Wi-Fi connection when compared to the iPad Safari browser. The 16GB version of the Kindle Fire HDX costs $379, or about $120 cheaper than the iPad Air. For larger companies that want to stick with a Microsoft operating system, the Nokia Lumia 2025 is one of the best tablets around. (The recently released Microsoft Surface 2 is another good option). The tablet is 0.35 inches thin and weighs 1.35 pounds, so it's a bit bulkier than the HDX and the iPad Air, but not by much. Battery life runs about 11 hours. The main reason to pick this tablet is if you have standardized on a Microsoft ecosystem. Pre-installed Microsoft Office apps, including Word and Excel, run in the Metro interface, as does Internet Explorer, the browser that works best for enterprise apps designed for IE. For companies using Windows 8 on servers and computers, the tablet fits in perfectly. App selection is abysmal, however. You won't find tablet apps such as Freshbooks or HootSuite. If you buy a smartwatch for work, like the Pebble, you won't find a related app. When a new app debuts -- such as Bitpay, which lets you scan Bitcoin QR codes -- there isn't a Windows RT version. In fact, the Windows RT store is mostly filled with second-rate games and fluff. The Lumia 2015 costs $499 if you don't sign up for 4G service. On a two-year contract, the Lumia 2025 costs $399 for the 32GB version, or about half the storage of the top-of-the-line iPad and HDX models. Overall, it's a solid Windows tablet with a bright screen, but it's woefully short on apps.